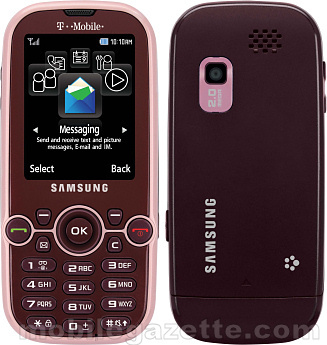 The Samsung Gravity 2 (also known as the Samsung T469) is exclusive to the T-Mobile network in the USA, and it comes with a slide-out QWERTY keyboard and 3G support. Primarily designed for messaging, the Samsung Gravity 2 isn't a particularly high-end phone. There's a standard 2.4" 240 x 320 pixel display, a fairly basic 2 megapixel camera, Bluetooth, an MP3 player and support for microSD expandable memory. Samsung say that the Gravity 2 has "Band IV" UMTS, which indicates that it only supports 1700 MHz 3G, which is fine for T-Mobile in the US, but if you want to roam to Europe then you will need to fall back on the phone's quad-band GSM. The Gravity 2 does not support WiFi. The main selling point with the Gravity 2 it its messaging capabilities, designed to interface with AOL, Yahoo! and Google mail plus standard internet formats. There's also an RSS news reader, a web browser and a set of personal information management tools. 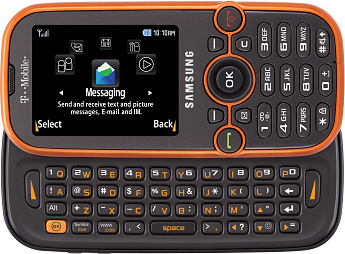 The slide-out QWERTY keypad has a fairly conventional layout with a small space bar in the centre (much more convenient than the Nokia N97, for example). The spacing between keys is good and should help to prevent more than one key being pressed at a time. There is also a useful "www./.com" key to make entering web addresses easier, and perhaps a rather less useful "smiley face" key. The Samsung Gravity 2 measures about 4.5 x 2.1 x 0.6 inches and weighs 4.4 ounces (or 114 x 52 x 15mm and 125 grams). Talktime is up to 5.5 hours with a maximum of 12 days standby time, we assume that these are GSM-only figures though. It's not the world's most exciting phone, but it does manage to squeeze a decent keyboard into something that looks just like an ordinary cellphone, without making it too bulky. Samsung say that the Gravity 2 should be available on T-Mobile USA from August onwards in a variety of colours. No guidance was given on price, but the original Gravity is around $30 after subsidy and rebates.